Most microbes do not live as free-floating organisms but as dense sessile communities that predominate over the planktonic phenotype. These, which are called biofilms, are surface-associated consortia of microorganisms embedded in a matrix of extracellular polymeric substances including polysaccharides, proteins & DNA. Bacteria in biofilms can modify their gene expression and exhibit complex responses to stressors. Because of cell-cell proximity, heterogeneities, gradients, couplings and the specific matrix environment, biofilms also have complex social interactions (e.g. communication, competition) and convoluted architectures. 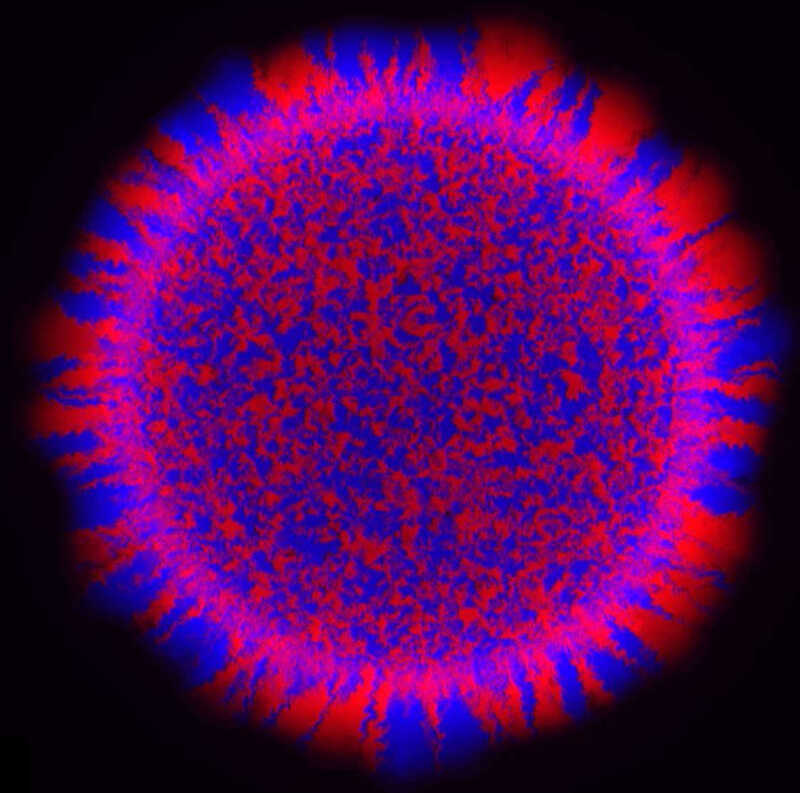 2D individual-based simulation of the growth of a bacterial population with mixed morphotypes. Animations made by WPJ Smith with a code based on CellModeller4 (TJ Rudge et al., ACS Synthetic, 2012). We use our expertise of mechanics and transport phenomena to study the biomechanics of biofilms. Recently, we have looked with colleagues from Oxford at the influence of bacterial morphologies (coccus, bacillus) on the spatial distribution of cells within mixed colonies. Results, which are now published in a PNAS paper, show that cell growth and mechanical interactions generate a layering effect whereby longer rod-shaped cells end up predominantly close to the solid substrate and spherical ones close to the fluid interface (somehow opposite to the Brazil nut effect). This has important implications, e.g. for grasping the evolution of bacterial morphologies. This work was based on 2D and 3D individual-based modelling with GPU calculations coupled to a finite-element resolution of nutrient transport via FEniCS, novel theoretical analyses, and experiments of binary shape mixtures of E. Coli bacteria imaged using confocal laser scanning microscopy. Fluorescence imaging of a binary mixture of E. Coli morphotypes (Smith et al., PNAS, 2016).